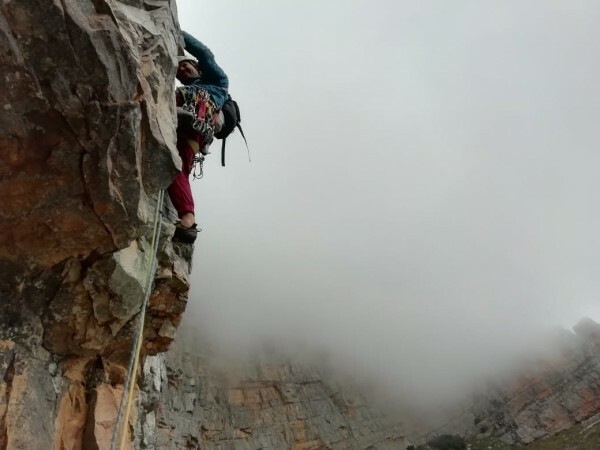 From Snort’s posts about new routes at Yellowwood and the route guide he has put together of the area I gathered that climbing there was not a straight forward day out, but his enthusiasm for the place made me promise myself that I will go climb there someday. Luckily when someday arrived, January 2018, WildX was holidaying in Cape Town and because he didn’t know about the walk in I could convince him to join me on Smalblaar ridge which I told him is the best introduction to how not to die on Yellowwood. We followed Snort’s how to Yellowwood to the word, even leaving hexes behind, which off course brought about serious comments every time we came across perfect hex placements. But we finished Smallblaar and the sun only hit us once we were on top and then proceeded to burn us off the mountain. The walk down was painful and very unenjoyful making WildX declare that he will never come back, while I was just trying to not cry from the pain in my knees. This time, January 2019, I couldn’t believe it when WildX wanted to join me again, and I had to talk him out of trying Divine Time, saying that after the suffering of last year let’s do Lekker Time(lekker is a South African word loosly translated as great or awesome) and see if we’ve really got what it takes to do one of the looong routes. 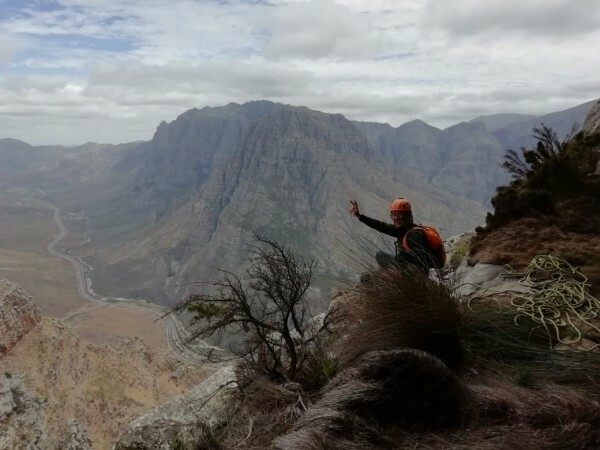 Our time in Cape Town coincided with a partly cloudy 20˚C Du Toit’s Kloof forecast so we got up earlier, took even less gear, making sure we carried nothing unnecessary and tried beating the sun on a longer and more difficult route. We left the car in the dark, unable to see the first land mark, the electricity pylon. But maybe because we’ve been there before or because of proper cairns along the way we easily found the path. The day was cool and the walking easier than we remembered. Ching chong cha(rock paper scissors) and WildX sets out on the first pitch at 7:30. I decide to combine pitch 2 and 3 to try and save some time. It was cold and windy, we had to climb with jackets on, but that is better than unbearable heat. Then, on the big ledge, seeing the next two pitches, I felt bad that it looked like I combined the best two pitches of the route and offered my climbing partner that I will do the next two and he could lead the last two which looked better from where we stood. 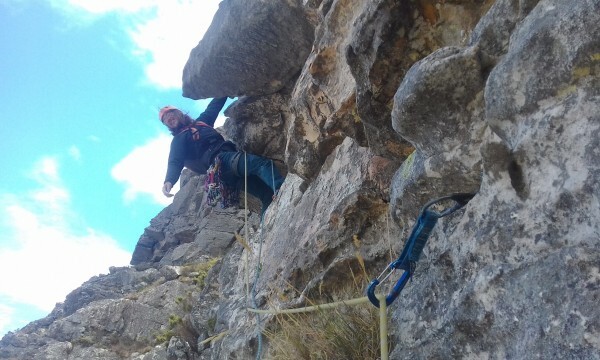 So I combined pitches 4 and 5, we had to simul-climb about 10meters to get this right, as the two pitches together is longer than 60meters, exactly like the route guide stipulates. Wild X led pitches 6 and 7. The 7th pitch was the only place we weren’t sure where to go, but got it exactly right after WildX found a chalked layback jug under the roof. 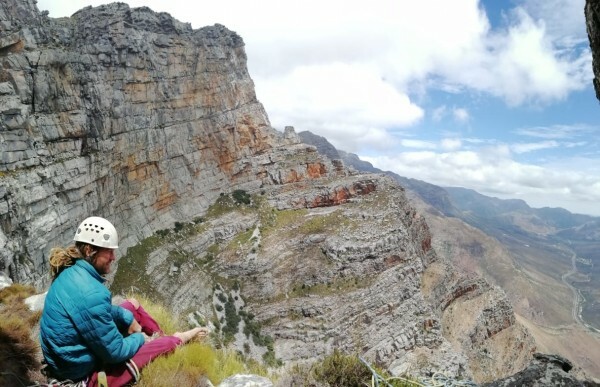 We had a quick bite to eat on the ledge that leads down to the Timerity abseil(bolted rappel route). By the time we were at the bolts the wind had picked up and our ropes were blowing all over. But the abseils were uneventful and we were at the base finishing all the food and water we had(second lunch) before the walk down. We had a lekker easy day, arriving back at the car at 3o’clock, leisurely driving back to Cape Town, when the only serious event of the day arose when we got a flat tire in a road works area of the highway. There was a concrete barrier on the yellow line so no space to pull into to leave the lane open. But the concrete barrier had two pieces missing that we pulled into, parking between the yellow line and a meter deep trench dug next to the highway. Wild X changed the tire with no space to spare between the car and traffic in the left lane. That tire change was awful! I only found my Peninsula Select (a heavy! route guide book for Cape Town) in the zipped pocket under my pack’s top the next day. So much for carrying only essentials. Gymnogene is a trad climber from Pretoria, across the atlantic. Nice job! Neat looking scenery. Is that sedimentary rock, like limestone, or metasedimentary rock, like gneiss? Nice! Were there right after Xmas 2017 & climbed both of those fun routes. Things were still smoldering a day after a fire scorched much of the approach. 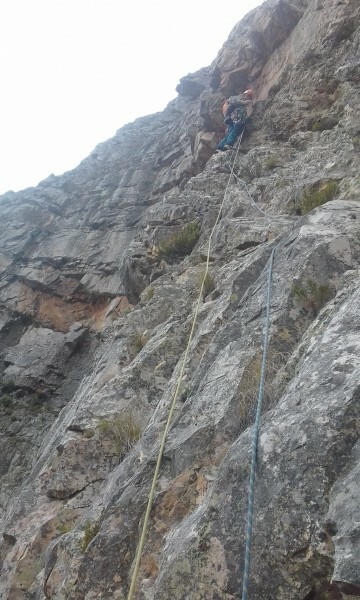 So many big & uncrowded objectives right outside of Cape Town while all the visiting climbers are gunning for Table Mtn. what'dya bring for lunches? elevation at yer crag? what's up with the local flora and fauna there? any pokey or particular best-avoided critters in the cracks and on ledges? we had left over barbeque meat and sausage, boiled eggs and some tinned sardines. "There is no track record of anyone being attacked by wild life or insects at Yellowwood. Leopards are endemic to the area and are spotted from time to time. Read Johann Lanz’ account of the first ascent of African Time in this regard. Baboons will bark at you and you may see scorpions and snakes. I have never had any insects bother me other than the odd fly. 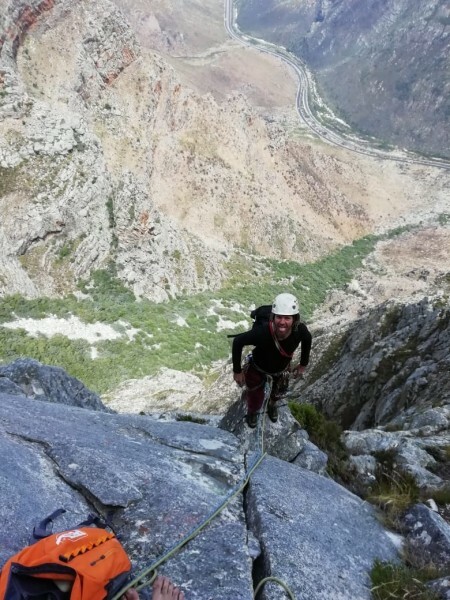 Theoretically there should be many puff adders but in all the years of climbing there I have only seen one tiny one all curled up and minding its own business at the start of the 4th pitch of Fantastic Time from the halfway ledge." There is a plant called blister bush in the Western Cape mountains that secretes a photo sensitive sap. If you touch the plant and then expose the area to sunlight it forms painful blisters but they are easily recognised and avoided. "The approach to Yellowwood Amphitheatre involves an 840m elevation hike starting at 360m above sea level to the base of the main amphitheatre that is at 1,200m. The main wall then continues vertically top out at just below 1,500m above sea level." thanks for a view to that exotic (to me) outing! do post up again next time you get out! Cool! It looks fun climbing. We’re used to barking baboons on this website. Cloud cover can be a savior. Very cool report. Being in the N. Hemisphere, it took me a few to answer the subliminal question WHY THE HEAT? Our thanks to the WildX, too. Reilly exaggerates, he's the only baboon here. Sweet! Some righteous runouts in those pics. Bei danke me kerels (excuse the grammar). Is Yellowwood Canyon anywhere near the classic NW Frontal? “There are still leopards in the Cape Mts “surprisingly close to Cape Town.” So your lolling in the grass was far more dangerous than you let on! Nice work lads. I had to GOOGLE the word lekker. Its a Dutch word/phrase. Look....Supertopo teaches me something new every day. ‘Lek’ is a germanic root which in Norwegian/Swedish (my German is non-existent) means play. A ‘lek’ in the ornithology world is a place boids gather to strut their stuff and ‘hook up’. Rustie, forgive me for saying so but your Afrikaans is a bit rusty. Yes, Yellowwood is in the same valley as NW Frontal, very close but a different peak. If you are the Rusty Baillie, then I know of you!